Still Alice (2014), PG-13, 101 minutes - Each year I try to see as many of the Oscar nominated films as possible before the night of the awards. Due to its release schedule and the winter weather we have had in the area this past week, Still Alice ended up being the last of these films that I was able to take in, and I'm glad that I did. Alice Howland (Julianne Moore) is a renowned linguistics professor at Columbia who is diagnosed with early onset Alzheimer's after experiencing some disorientation and intermittent memory loss. Her husband John (Alec Baldwin and grown children Anna (Kate Bosworth), Tom (Hunter Parrish), and Lydia (Kristen Stewart) are all very supportive of Alice, but everyone's anxiety level rises when they learn that her Alzheimers has been classified as 'familial', meaning that it is genetic and may have been passed on. The film shows Alice's slow mental deterioration and her efforts to combat it. Julianne Moore gives a spectacular and nuanced performance, one that is a virtual lock to take home Best Actress at tomorrow night's Academy Awards. She really nails the act of faking her way through things when she's around others as well as the sheer terror that envelopes her when she loses her way on her own. At the same time, she has the determination to battle on of a person who is slowly losing what they love most in life. Alec Baldwin's turn as John is under appreciated - strong, supportive, and understanding. Kate Bosworth and Kristen Stewart also turn in better than usual performances as Alice's daughters. Still Alice is a very emotional film, especially for anyone who has been effected by Alzheimer's in one way or another. I admittedly broke down on a couple of occasions. 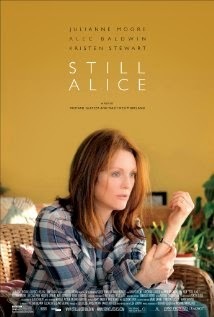 If you want to see a very good movie driven by an excellent performance, be sure to give Still Alice a watch. Just be prepared, because there's an equally excellent chance that you'll be reaching for the tissues.